A holiday house on Lanzarote costs on average USD 835 in the cheap travel period and USD 1,503 in the peak season per week. These details are of course in relation to the house and not per person as well as includes the obligatory additional charges. 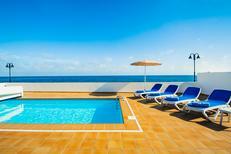 Lanzarote holiday apartments are among the best on the Canary Islands. 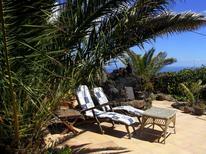 Lanzarote, often called the ‘Island of Eternal Spring’, boasts consistently beautiful weather. 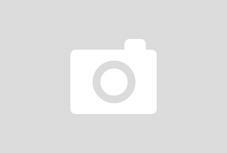 It has superb conditions for visiting the beaches and other natural surroundings. In the capital, Arrecife, you’ll find historic sights, including the castles of San José and San Gabriel, and many great coastlines to enjoy. With your own holiday home on Lanzarote, you can make the most of the weather and ambience with your a private pool, eat on the terrace in the warm evenings and be close to all the best hotspots, too. On Lanzarote, find a holiday apartment in the Atlantic that suits whatever you’re looking for, be it lots of space for family and friends to stay or proximity to the beaches. 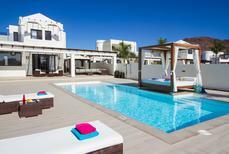 The main draw for many visitors to Lanzarote holiday apartments is the island's excellent weather. Throughout the year, temperatures are almost always in the 20s or above. The popular beaches include Playa Grande at Puerto del Carmen – see the famous Veradero Rock and go snorkelling amid excellent conditions. Playa Blanca, another great seaside spot, also has a water park that will surely keep everyone in the family happy on holiday in Lanzarote. At the capital, Playa del Reducto is the closest major beach – enjoy walks around the attractive port here. With your own holiday letting in Lanzarote, you can make the most of the island by choosing the exact type of accommodation to suit your needs. Larger villas and countryside homes, many with their own pool, are perfect for groups of friends and families looking to experience Lanzarote together. You can wake up and go for a swim first thing if you please, without even having to leave the confines of your holiday property. 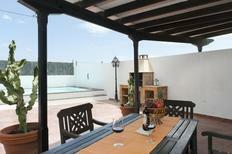 Outdoor space for eating dinners together on warm Lanzarote nights also make holiday apartments particularly desirable. There’s no beating the authentic feel of a real Spanish home, either, and you can trust in safe booking to ensure all you need to worry about is when to hit the beach or pool every day. 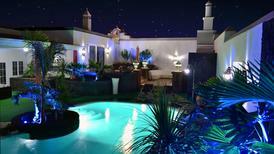 The island of Lanzarote caters well to families. With historic ports, coastal paths and hiking trails, active families will have a fantastic time getting to know the island intimately. Renting a bike, or a car if you want to go further, is a great way to make the most of the natural surroundings. You can also book a coach to destinations such as Timanfaya National Park to take in the volcanic landscape. Dog owners will be able to walk their furry friends around the calm beaches and parks in the towns, and couples can spend a whole week enjoying the privacy of their own villa if they wish. As part of the Canary Islands, Lanzarote is heavily influenced by Spanish mainland cuisine, and also has several regional specialities to try, too. Fish and shellfish are very popular, as well as meat such as pork, often served with cheese and olive oil with artisanal bread for a satisfying Mediterranean lunch. Try sancocho, a fish stew, and Canarian mojo, a garlicky sauce that accompanies many meals. Tapas, also very easy to find, let you indulge in several little dishes, whether you’re a meat lover or vegetarian. Of course, with your own Lanzarote holiday apartment, you can buy food at the markets and supermarkets to prepare at home, too, if you wish. 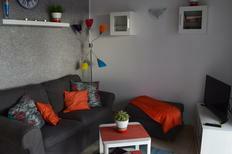 Spain is known for its beautiful houses, and Lanzarote is particularly great for its mix of large and more compact homes. 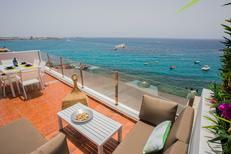 You can opt for being a stone’s throw from the beach, perhaps picking a holiday apartment with a sea view. Villas often have their own pools and patios, excellent for when you want to escape the crowds and just relax in the sun or have some drinks and Spanish nibbles in the evening. You can also rent a finca, a type of Spanish farmhouse that mixes traditional charm with plenty of indoor and outdoor space for all your travelling companions. There’s a wide choice of attractions to see on the island, and you'll rarely be far from the beach and other beautiful natural features when you stay here. The west coast of Lanzarote is special for its proximity to Timanfaya National Park, which boasts volcanic views and the green lagoon at El Golfo. The east coast of Lanzarote is where you’ll find Arrecife, Playa del Reducto and historic castles and museums to explore. The south coast of Lanzarote is home to international-feeling Playa Grande and its bars, clubs and restaurants catering to global holidaymakers. It’s here you can find Irish pubs, miles of golden coastline and plenty for families to do together, such as water sports or going for coastal walks. Lanzarote, a popular destination for sun seekers, is very well connected to the outside world. Lanzarote Airport (ACE) is 4.5 hours from London. As the airport is conveniently placed between Arrecife and Playa Grande, it’s easy to get a bus, taxi or rental car and drive to either destination or anywhere else on this compact island in no time. 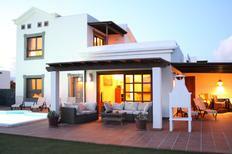 It takes just ten minutes to get to Arrecife, 15 to Playa Grande and a half-hour to El Golfo on the west coast. The choice is truly yours as to when to visit this sun-soaked island, as even in the heart of winter, you can expect temperatures in the 20s. Summer is the most popular time, although winter holidays are also great for escaping your rainy hometown and making your friends jealous with all your beach photos. However, winter and summer are therefore the busiest. If you prefer a bit more calm activities away from the beach, such as hiking, cycling and general sightseeing, spring and autumn are also ideal.